Sports is the key to maintain a healthy population, now and in the future. But according to Margaret Talbot from the International Council of Sports Science and Physical Education, very little attention and money is spent on sports in the nations of the world compared to other major expenditures such as education. It has been predicted that inactivity causes an estimated of 300,000 deaths each year in America alone, and in the UK one in five men, and one in eight women, die prematurely from coronary heart disease. In nations with large populations these numbers are swelling, e.g. India, where the numbers of diabetics increase incrementally every year. Today India is home to a staggering 62 million diabetics. In China one in four adults is pre-diabetic or diabetic, which will be an enormous strain on the medical infrastructure in the future. The Nordic countries are among the most physically active countries in the EU, whereas the Southeastern countries are in the far other end of the scale. In Sweden, 72 percent of the population is exercising regularly, meaning once a week or more. The Finnish people are in a close second with the Danes in third place. In comparison Bulgaria, Greece and Italy have the fewest citizens being physically active on a regular basis with, a mere 3 percent, according to a study from the European Commission on sport and physical activity in the EU from 2010. In total the majority of the EU citizens get some physical exercise at least once a week with 65 percent in all of the EU. Not too surprisingly young men and women in the age group 15-24 are the most active of the EU-citizens, with young men tending to exercise considerably more than young woman. You can see the whole report in this link. Or you can watch this video about that the lazy youth risk their health. 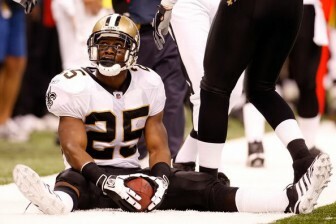 Was the New Orleans Saints involved in match fixing? Foto: Cardinals17. Much has been said on the subject of match fixing the last few days of this year’s Play The Game conference. But what seems to be the case is, that no one really has given much thought about the definition of match fixing. That was until researcher Karen Jones from T.M.C Asser Instituut, Asser International Sports Law Centre, asked the question: How do you define match fixing? According to the Dutch speaker there is no universal definition of match fixing – only a lot of variations at national, European and international level. And that is probably one of the key problems when working with legislating match fixing. “You can’t effectively manage, what you can’t define. There’s no need to create something entirely new, we just need to define what’s already there” she stated, at Wednesdays session. International sports should be crying out for a common definition that can help public understanding support the national law development, and thereby contribute to harmonization. A common definition could be key in creating good governance in sports. The lack of clear definition leads to cases, which leave sports ethics on a knifes edge. Karen Jones herself named the NFL Bounty Scheme as one example of jeopardizing the ethics, and a scheme which according to some definitions could be considered match fixing. Last year it was concluded that coaches of the NFL team New Orleans Saints would pay additional bonuses to players causing serious injury to members of the opposing team. The fees were nominal when the players salary was taken into consideration, but it could be construed as incentive to alter the outcome of a match by injuring the opposing team. “Under the national american plan it was perceived as match fixing, but according to the European Counsil it wasn’t,” she added. During his speeches at Play the Game, Harri Syväsalmi, Director of Ministry of Education and Culture in Finland, has explained that shining a light on match-fixing is an important factor towards fixing the issue. ”What we need to do is to raise awareness. We are fighting criminal organisations, and we should act accordingly,” he stated. Senior specialist Nick Garlick of Europol concurs, and explained that investigations serves a bigger purpose in the fight than singular convictions of athletes and criminals. “We need greater awareness, and the biggest success of the recent investigations is the greater awareness of the issue”. Whistleblowers get a bad reputation, and generally suffers more under the guise of being “rats” than the actual perpetrators of match-fixing. 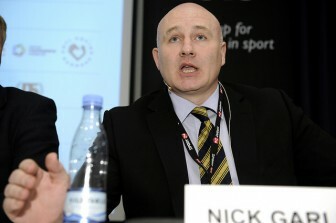 And as Nick Garlick explains, that attitude needs alteration for something to truly change in the world of sports. Harri Syvasalmi agrees, that the athletes should be treated as heroes for blowing the whistle, rather than like criminals. “Athletes needs to be a part of the solution from the beginning, instead of a part of the problem”. The lack of good governance is without a doubt one of the biggest threats in sports. That is why transparency and openness is needed. “All sports organisations should be as open as possible. Because that is, what transparency is all about,” Frank Van Eekeren, Senior Consultant and co-researcher on the AGGIS-project, noted Tuesday morning at the Action for Good Governance in International Sports Organisations workshop at PlayTheGame 2013. Although we, in the western world, are used to transparency, not all organisations respond to the demand of openness. That is why action needs to be taken. If organisations refuse to cooperate, external pressure is needed. That can happen through evidence-based research and by including the organisations and making them understand the importance of good governance. Furthermore making the organisations aware, that research to help them is being made. “We have to make them understand, that we are not only there to shout, but also to help organisations,” says Arnout Geeraert, PhD and co-researcher on the AGGIS-project. The EU is also aware of the lack of transparency in sports organisations, and in recent years the have gradually joining the fight for good governance internationally. And acoording to Morten Løkkegaard, Danish member of the European Parliament’s Committee on Culture and Education, we need to force the sports organisations to be cooperative, e.g. by naming and shaming those, who neglect democracy and transparency. Tuesday at the conference, we cornered the Danish editor of Play the Game Søren Bang and asked him, what he thought was the biggest threat to sport today. In a world where big money can be made by match-fixers and corrupted masterminds, the need for democratic representation, accountability and transparency is even more important. Therefore a group of researchers collaborated on a joint venture, and created a tool to improve governance in sports. We need to help the sports organizations to create good governance,” Arnout Geeraerts, PhD Student and co-researcher on the Action for Good Governance in International Sports Organisations, stated on Tuesday’s workshop at the Play the Game 2013 conference. According to the researchers there are four main domains of good governance – transparency and public communication, democratic process, checks and balances and solidarity distributed on 47 indicators. When identifying governance in a specific sports organization all 47 indicators have to be taken into account, and are given a 1-5 score in a scoring system showing the level of governance and transparency. 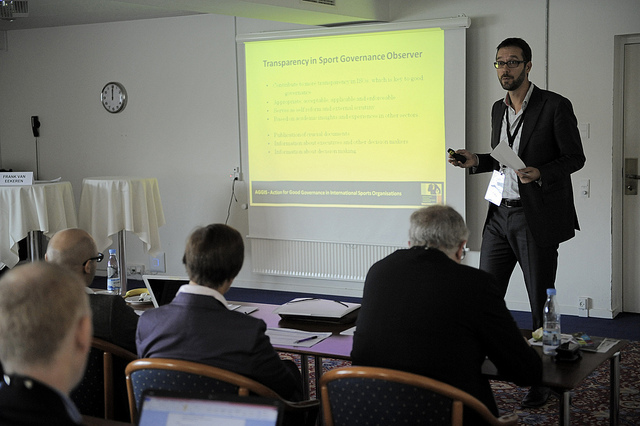 Although the sports governance observer is still under development, Tuesday’s workshop at Play the Game 2013 showed a great consensus about its eligibility in the fight against the lack of good governance. “Not much has been done when it comes to international sports governance,” Arnout Geeraerts noted. The next step for the sports governance observer is to review 35 big global actors. Match-fixing on the Political Agenda: What can EU do? Over the recent years matchfixing has become a serious matter for The European Union. But with matchfixing being a subsidiary national matter, the possibilities to intertwine politics and sport are limited. “The extends of matchfixing is a shock for all of us. It’s all about telling the stories and getting them out in the light. In that way matchfixing gets the political attention,” says Morten Løkkegaard, who applauds the presence of organizations like PlayTheGame. In december last year matchfixing hit the political spotlight, and for the first time it was truly on the political agenda at a top meeting. Hopefully that’s not the last time, Morten Løkkegaard stated. “The top meeting gave us some useful conclusions and directions to the committee and the EU nations on our work in the future,” says Morten Løkkegaard. According to Morten Løkkegaard it’s hard to predict, when we will see a measurable impact by the cooperation between the EU and the organizations fighting the matchfixing. But he is completely aware of, what is needed. “We need to create transparency and force the organizations to be cooperative. And we can do that, by naming and shaming those, who neglect democracy and transparacy,” Morten Løkkegaard adds.